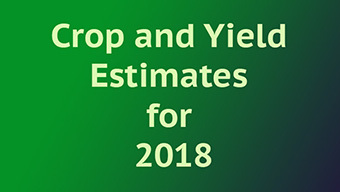 Yield and production estimates for the main cereal crops and potatoes for the year 2018 were issued today by the Department of Agriculture, Environment and Rural Affairs (DAERA). * Barley: Total production of barley increased marginally to approximately 117,200 tonnes, an increase of 2%. Both spring barley and winter barley yields recovered from the low levels recorded in 2017. In 2017, the spring barley yield was at its lowest level recorded since 2012 but has now recovered to approximately the five year average of 5.2 tonnes per hectare. Winter Barley yields made a modest recovery of 2% resulting in a yield of 6.9 tonnes per hectare. The overall area planted decreased by 2% from 2017 levels with the area of winter crops decreasing by 18% and the area of spring crops increasing by 6%. The area planted of winter barley was hindered by the poor planting conditions in autumn 2017. Despite the reduction in the area of barley planted, the higher yields have resulted in a 2% increase in production. Cropping conditions were a lot more favourable in 2018 than 2017 which will have increased the harvest. * Wheat: Production of wheat decreased from 2017 levels to 47,700 tonnes, a decrease of 29%. The area grown fell by 22% to 6,800 hectares with yields falling by 9% to the same level as 2016. The area of winter planting fell due to the difficult conditions in autumn 2017 while yields suffered because of the dry summer experienced in Northern Ireland. * Oats: As with wheat, both Oat yields and area planted decreased in 2018. Oat yields decreased by 10% to 5 tonnes per hectare in 2018, the lowest they have been since 2013. The total area of oats planted decreased by 11% resulting in a decrease in production of 20% to 10,200 tonnes in 2018. * Potatoes: The pre-harvest production estimate of maincrop ware and seed potatoes is 114,700 tonnes, a 25% decrease from 2017. In 2018 the area planted decreased by 11% to 3,600ha with yields decreasing by 16% The total pre-harvest estimate, including early varieties also decreased by 25% to 116,100 tonnes.